100% finest & softest alpaca yarn, ideal for next-to-the-skin wear by babies, children and anyone with sensitive skin. 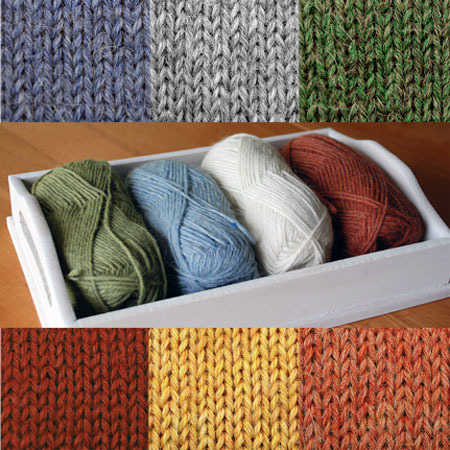 4-ply DK weight is perfect for sweaters, scarves, afghans and hats. Our most popular yarn weight. New colors being added often: please inquire. CLICK HERE to see our color chart. CLICK photo to�view detail page. Please bear with us as we transition our stock to our new Baby Alpaca grade. Most colors not yet found here will still be available under Classic Alpaca Yarn in clearance. Both are DK weight. Baby Alpaca Classic and Alpaca Classic are completely compatible as to yarn diameter: you may use them in the same project. However, be mindful of dye lots: in a single project, each color should be worked all in one dye lot. 110 yards in 1.75 oz. (50 grams). Gauge = 5.5 stitches per inch from US #6 needles. Center-pull skein. Dry clean or hand wash. Made in Peru.